Music starting at 8, with 7:30 Doors and We bumpin' Until 1AM! This event will be All Ages but valid ID must be provided in order to obtain BYOB wristband. The first Pitt Fest was sort of a joke- It was literally on April Fools 2017, it was only one night, one venue, and nine bands. 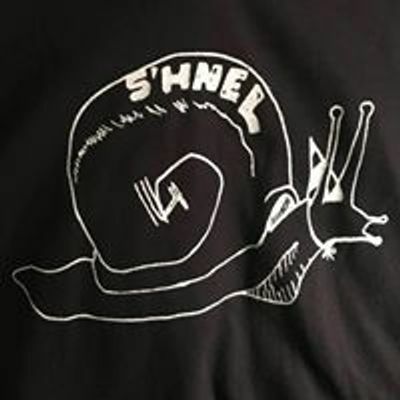 Booking too many bands on a gig is something the Bushnel had been doing since conception, leading some to refer to them as "Fests." The night was also co-organized with friends made through WPTS Radio, so naturally we booked all of the bands that our friends from Pitt were in; and "Pitt Fest" was born. By Spring 2018, after a whole new year of gigs and meeting people it was clear the talent that was attracted to Pitt, as well as the city and all of its other universities as a whole, was too much to contain in one day - so Pitt Fest expanded. With a continued attempt to keep the theme of Pitt Fest in tact, all of the bands (excluding those from out of town) boasted at least one member whom attended Pitt at some point. Though the theme is relatively arbitrary considering the welcoming of touring groups, dropouts, graduates, and current students alike. Pitt Fest expanded to four days in 2018 from Thursday March 29th - Sunday April 1st; Which just so happened to be Easter Sunday. The Expansion included two days at the Bushnel as well as a South Oakland Marathon around different house venues and a night at Ba Sing Se (much love). Pitt Fest started as a glorified WPTS party and was growing into something that was more about the greater music community that thrives in Oakland, because of Pitt and the city's other universities providing a plentiful source of interested youths. Chances are if you were ever a young musician in Pittsburgh you had your start, or at least played once, in an Oakland basement. 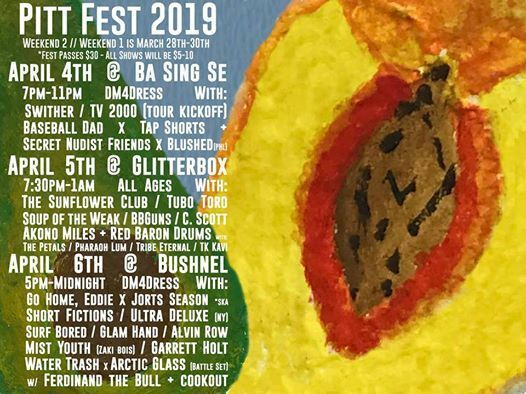 Pitt Fest aims to celebrate the DIY basement scene in Pittsburgh as a current environment and as an origin for much of the city's talent. In 2019 Pitt Fest is moving to celebrate potential origins in the basement scene with a simultaneous appreciation and celebration for the potential growth out of those spaces. 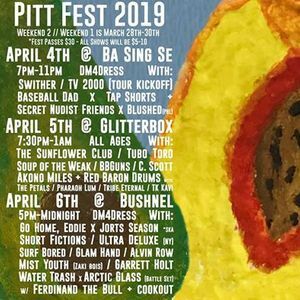 Now, Pitt Fest is expanding to six days, over two weekends and to venues outside of Oakland basements, including All Ages spaces such as The Mr. Roboto Project and The Glitter Box Theater as well as two shows at Bloomfield's own, Howlers (21+). The loose Pitt alum theme is continued as well as welcoming five touring bands, two of which happen to also boast Pitt Alum. All the money goes to the bands, because bands need payed. Maybe if Pitt Fest continues, down the line we can raise money for some sort of collegiate focused charity, like to help under privileged people pay for school or something, I don't know, that would just make sense. Thanks to Everyone who helped, or is allowing to make this happen.